Culled from First Century Texts and drawn from dozens of biblical and secular sources, these 88 monologues tell a revisionist tale of what transpired in Judea, Easter Week/Passover 33AD and beyond during the reign of the Roman Emperor Tiberius. In the timeless argots of Petronius, Chaucer, Shakespeare, Swift, Lenny Bruce, Guy Ritchie, James Joyce, David Jones, Cockney and the world’s myriad cryptolects, The Canaanite Gospel strips bare the New Testament canard of the Resurrection of Yeshu of Nazareth and pokes a stick in the eye of the Synoptic Gospels. Carlo Parcelli has spent 40 years studying the epistemology of science and technology and their effect on the natural world and naturally evolved cultures. He specifically challenged the efficacy of progressive systems of quantification, mathematization, mathematical discretion, formal systems game theory etc., since these elements form the core of the way western man can think about his world and all the limitations such an epistemology implies. 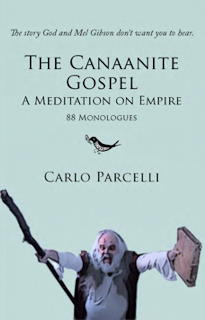 Parcelli has written 14 book length poems which embed numerous sources and elaborate in great detail his insights. He has also written numerous articles. Now, he is content to watch the Earth scribble its own Apocalyptic Epic in real time. Having failed to reach virtually anyone concerning his epistemological concerns and seeing the natural world taking its future into its own hands via global climate change, Parcelli embarked on a retelling of the Synoptic Gospels. He currently spends his evenings busking local bars in the Washington DC area dressed as Simon Kananaios, performing his monologues in exchange for drinks and the occasional monetary remuneration. Visit carloparcelli.com for performance videos and more.